Over at Splitcoast Stampers yesterday the Ways to Use It Challenge #379 called for masculine cards. So with Father’s Day just around the corner that definitely fit into this stamper’s plans! I stamped my image and then lightly colored it with Copics, highlighting the vehicle and flower. Then I used Ranger Glossy Accents on the windshield and headlights which unfortunately doesn’t show up very well in my photo. 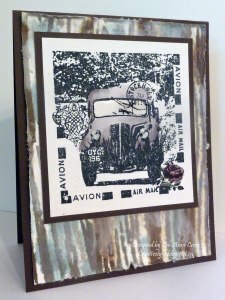 For my background, I dry embossed by paper with a wood grain embossing folder. Next using the direct-to-paper technique I added Pumice Stone and then Weathered Wood Distress Inks, spritzed it with water, then added spots of Walnut Stain, Picket Fence and Weathered Wood Distress Stains. Then the edges were distressed. Love your technique on that bg – it is beautiful! Perfect for your image. Wow! Way to take the direct to paper to a higher level! Fabulous work!! Bet your Dad loved this! !